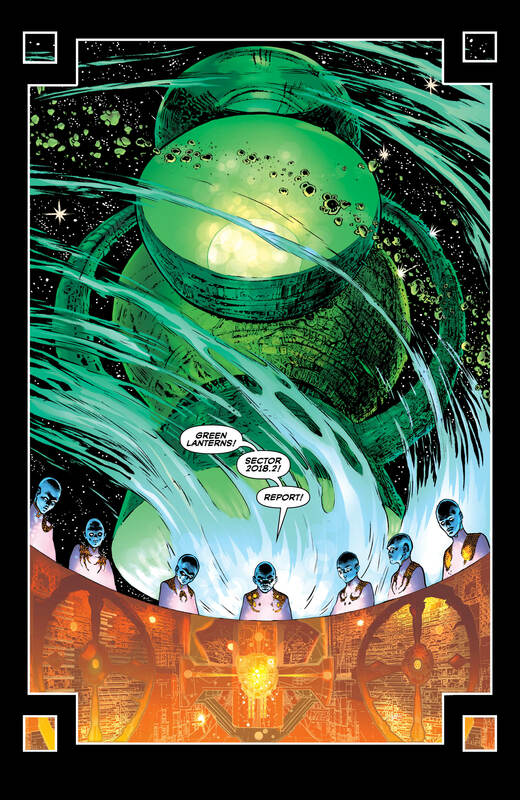 Review: The Green Lantern #1 By Grant Morrison And Liam Sharp – What the Heck is going on?!? 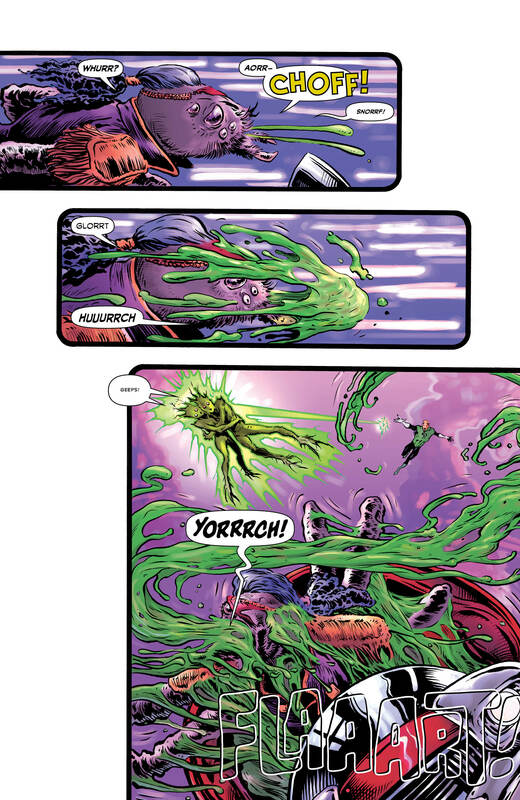 When Grant Morrison writes DC Comics characters, there’s a simple rule–Expect the unexpected. Morrison has a knack for taking well known and obscure characters and turning them into something fresh. He is able to approach the characters in ways we haven’t seen or thought of before. 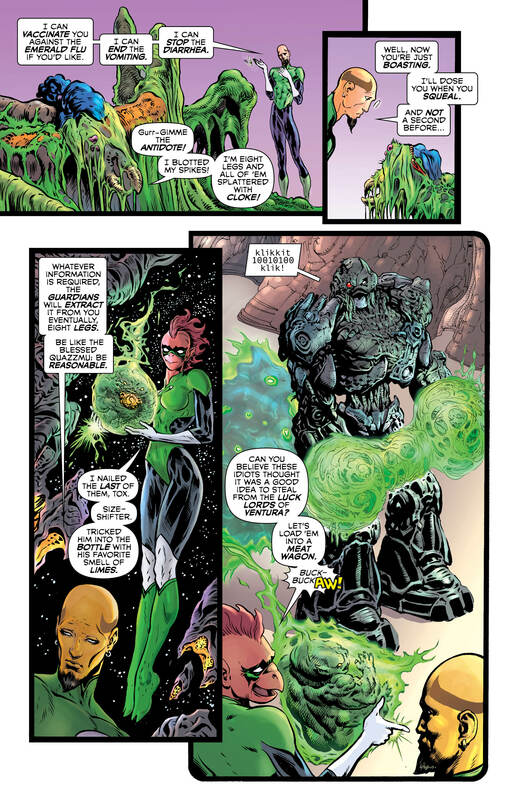 Now, Morrison is turning his attention to Hal Jordan and the Green Lantern Corps. The Green Lantern #1 cover by Liam Sharp and Steve Oliff. 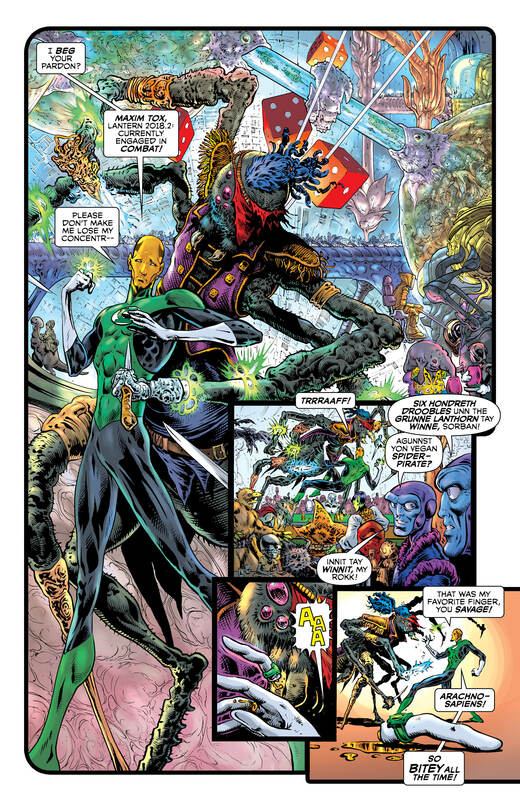 Joining Morrison on The Green Lantern is Liam Sharp on art with Steve Oliff handling the color. This creative team alone is all the reason comic readers need to check out this book. Sharp’s art always has a bold and expansive feel to it. It jumps off the page and into your face without being chaotic or distracting. The colors here are vibrant and help bring all the aliens and unfamiliar landscapes to life. Morrison takes advantage of Sharp’s style by immediately throwing us into a quasi-psychedellic battle on a strange planet filled with bizarre aliens. In the middle of chaos, we see a Green Lantern named Maxim Tox. It feels like an odd choice to start things out with a new character rather than Hal Jordan, but it soon becomes clear why this is the case. Despite the countless number of Lanterns we’ve seen over the years representing the different sectors in space, there is an extremely fresh feel to everything. It feels like we’re looking at a new corner of the DC Universe. 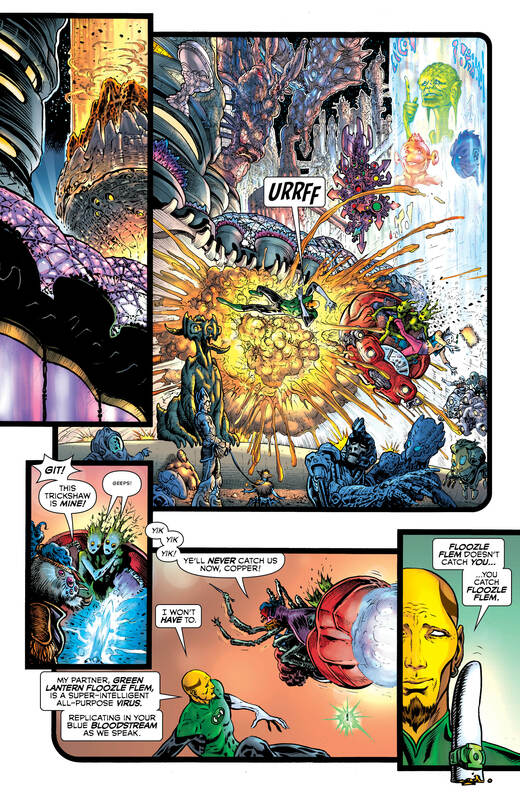 We also witness the aftermath of a battle involving the Lantern Corps attempting to protect an area. One panel in particular made me pause and admire the volume of attitude oozing off an alien’s face questioning the damage done to their place. It’s little things moments this that bring a smile to my face when reading. One of the things that’s been said about this title since it was announced at San Diego Comic-Con was Morrison’s approach. He wants to focus on the Lanterns as “cops in outer space.” That feeling is apparent from the beginning. This isn’t about the “adventures” of the Green Lantern Corps. This is about them doing their duty in protecting the universe. So where is Hal Jordan? He’s on Earth–likely grounded by the Guardians of the Universe. While this is the same Hal Jordan we’ve known for years, Morrison adds an interesting vibe to him. We’ve seen Hal in his civilian guise many times, often returning to his role as a test pilot. Morrison makes you think about how difficult that could and should be after being able to explore the furthest reaches of space. Just seeing the first few pages with Hal has changed the way I look at him. Of course, there’s a new threat and mystery that must be dealt with when Jordan is called back to Oa. It is clearly evident, just within a few panels, that some bad tidings are headed Hal’s way. The Green Lantern #1 variant cover by Frank Quitely. Green Lantern fans have been treated to some great runs over the years. From the classic Silver Age stories to Geoff Johns and Robert Venditti’s separate runs, Hal Jordan and the Green Lantern Corps have gone through a lot of changes and faced countless enemies. Now with Grant Morrison behind the wheel, there’s no telling what we’ll see next. Morrison is adept at scouring the DC archives and evolving the tiniest and most obscure ideas into something compelling and intense. Along Sharp and Oliff handing the art, this is a book that should not be missed. It’s a great sensation when you feel a big ball of excitement brewing inside with the thought of where this series could go. I’m not sure what we’ve done to deserve this book. I’m already counting down the days to the next issue. 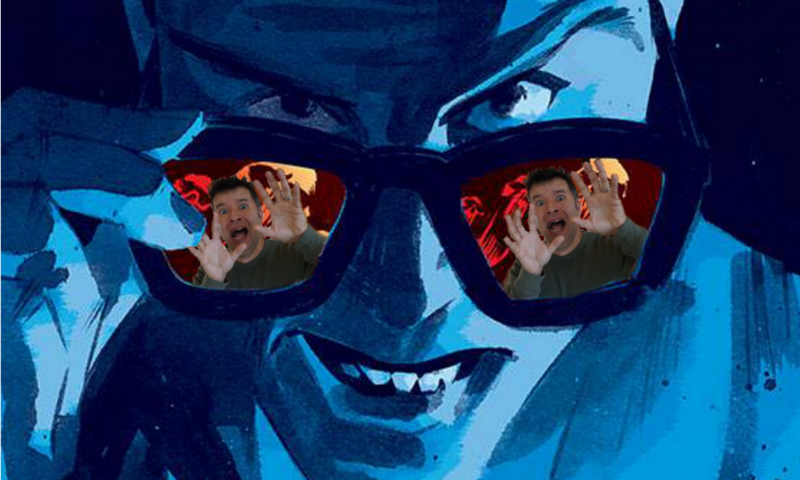 Pingback: Best Stuff In Comics This Week – What the Heck is going on?! ?